¤ UC-II® is the only patented form of undenatured (native) type II collagen. The type II collagens usually found in nutritional supplements are denatured or hydrolysed - in other words, their molecular configuration has been altered rendering them inactive. According to David Trentham, a Harvard scientist and world authority on type II collagen, “to be effective, type II collagen must be in its native form”. 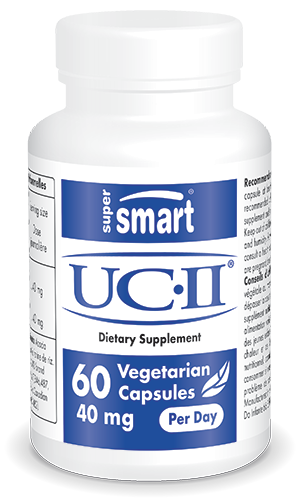 ¤ UC-II® also contains small amounts of glucosamine and chondroitin which are equally good for the joints. ¤ Taken orally, UC-II® works with the immune system to promote healthy joints through a process called oral tolerance. This process helps the body differentiate between foreign invaders, such as bacteria or viruses, and beneficial elements such as nutrients. Low doses of UC-II® taken orally stop the immune response targeted at the type II collagen in bone joint cartilage, improving joint mobility and flexibility. UC-II® thus appears to be an excellent solution for stemming decreased collagen in cartilage. Another supplement for maintaining joint health is L-proline, an amino acid which supports the body’s natural production of collagen. If you suffer from joint pain, you may find our supplement Palmitoleic acid, an omega 7 fatty acid, known for its pain-relieving effects.